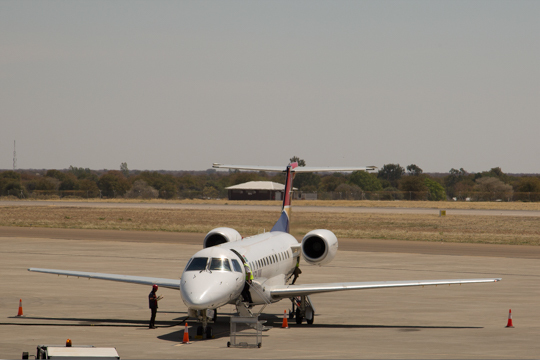 Once on board the Air Botswana flight, I started to relax. My first big worry was over - all my camera gear had been allowed onto the plane as hand luggage. My next uncertainty - the vehicle hire - was all that lay ahead before the trip could start. As it so happened, there was no need for anxiety. The guys from Avis were waiting at arrivals and treated me like something between royalty and a long lost friend, whisking me through to their offices close by to perform the necessary paper work. After an intensive educational tour of a brand new 4x4 Toyota, with more electronics than an average small plane, I set off to Old Bridge Back Packers to spend my first night. 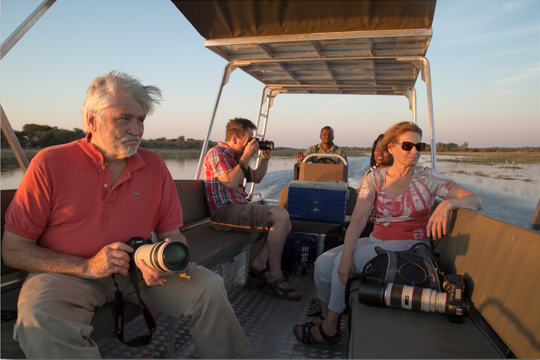 The following morning I'd be returning to Maun to collect Wolfgang and Monika, my clients and companions for the following 16 days. The country was preparing to celebrate 50 years of independence in September, which made it even more special to be back. Many of these united and proud people were sporting blue, black and white t-shirts advertising the celebrations due at the end of the month. Old Bridge Back Packers was stunning. 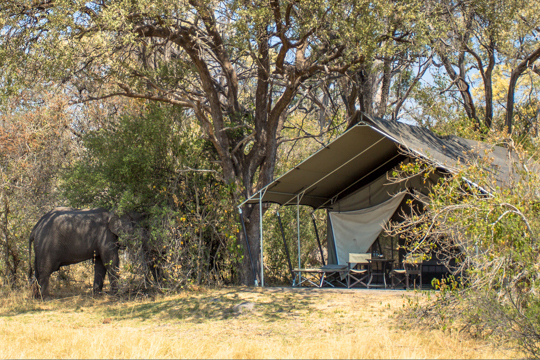 My en-suite tent on the banks of the Thamalakane river, had everything I could want. The bar and restaurant was a buzz, where travelers from all over the world shared their war stories, as well as travel tips on the roads they had travelled and places they had visited from Cape to Cairo. The food was good, the endless flow of beer was ice cold and the staff bent over backwards to help their guests. The day started early. As per normal I watched the sky and photographed the sunrise. Then the birds captivated my attention. The kingfishers especially put on a great show. Soon enough I said good bye to all at Old Bridge and headed into town for final supplies before going to the airport to meet the incoming flight. The plane touched down without even a bump and the guests passed through the officialdom nice and fast. In moments we were packed and on the road. At dawn we watched the sunrise with coffee and cameras, enjoyed a snappy breakfast and got on the road. 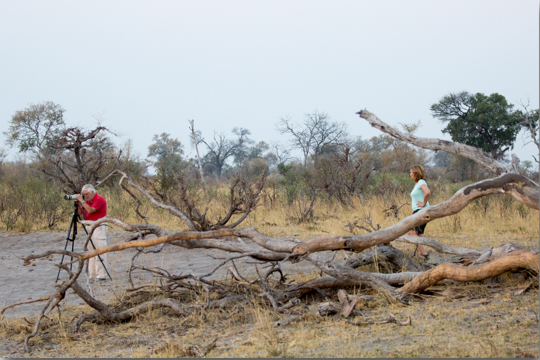 Thamalakane to Machaba Lodge in the Moremi was a distance of 73 km with a predicted drive time of four hours! Some travelers at Old Bridge had warned that my planned route promised a nightmare drive with pot holes and speeding trucks, so we changed plans and drove up through the Moremi, entering at South Gate and exiting at Kwai Bridge. The distance was the same, but it took … um … over six hours! At Kwai bridge the GPS revealed that we were a mere 7 km from the camp. It neglected to show that the road normally traveled was closed! After studying the map and chatting to a local we figured we could find the way on the bush tracks. That 7 km took two full hours, with many five-pronged forks catching us out and forcing us to backtrack! We arrived at the lodge none the worse for wear, even if we ended up coming through the back entrance. The staff were amazed we had made it via that route. Machaba Lodge is a gem in paradise! The staff, their friendliness and the way they will do anything to make you welcome, stood out. Cold beers, a late lunch of kudu pie and salads was waiting for us. We ate watching four elephants cool themselves in the river. After we were done, there was time for a quick trip to our rooms. Imagine my surprise on being shown to the honeymoon suite. Back at the lodge we enjoyed high tea before meeting our guide for the next few days, a man with the curious name of “Leopard”. Within minutes Leopard had my number and was testing me on birds and animals. Once he found out I knew most of them by their Setswana names, we got along famously. The first drive was amazing. 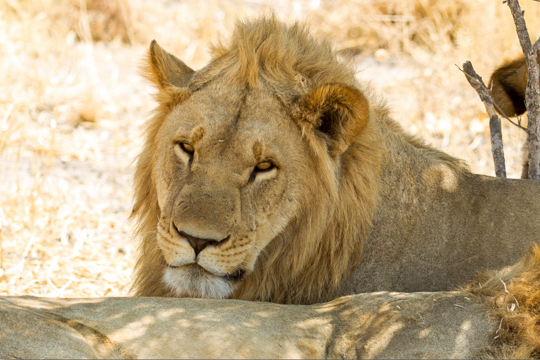 Lions, lechwe, elephants, hippo, and… and… and the birds! My starved mind raced to absorb it all. The drive ended and we were back at the lodge by 7:30 pm for dinner at 8. Then it was off to bed, with the promised wake-up call at 6 am for the start of the day. To Leopard's amusement I was up and dressed and ready to go when he got to my tent at 5:50 am! We enjoyed a yummy continental breakfast and climbed into the game viewer by 7 am. The drive was quieter than the previous evening, but there was still plenty to see… hyenas, sititunga, steenbok, elephants. A plethora of birds appeared over the course of the drive. We saw carmine bee-eaters, hornbills (yellow, red, ground and bradburys) and a brown snake eagle. We also spotted lilac-breasted rollers, storks, herons, babblers, shrikes and more. Leopard searched for his namesake, but without luck. As we returned for brunch he was all promises for the afternoon drive. Brunch… Wow! What a choice! Superb lasagna and a full English breakfast, home-made breads and muffins too. The afternoon drive focused on finding the elusive spotted cat! While we were at it we saw hippos, crocks, elephants, zebra, wildebeest, giraffe and birds galore. 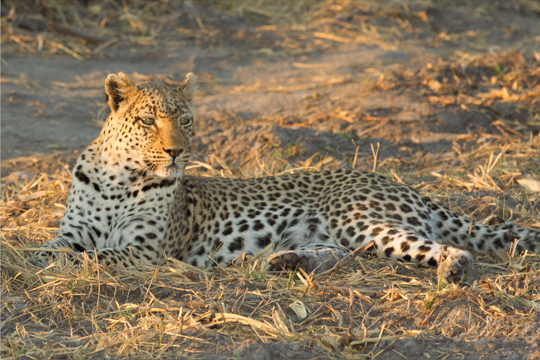 We had almost given up hope when we came upon a beautiful female leopard. She was dozing. She uncoiled with her best Cleopatra impersonation, slunk up a tree branch and gazed at us from the branch as if she ruled the world. She remained there for almost an hour, until it was too dark to photograph and she wandered off looking for dinner. Back at camp we enjoyed another awesome meal of roast lamb with all the trimmings as the stars rose over the horizon and the magical night sky reminded me of how fortunate I was! We opted not to do the morning drive, but to take a leisurely breakfast before leaving on the next leg of our journey to the Ghoha Hills Lodge. The drive can only be described as a severe test, both for me and for the vehicle. We opted to take the route through Savuti from South Gate to Kwai Bridge, over the Sand Ridge Route, in order to avoid the traffic and potholes on the other route. It looked like much more fun. 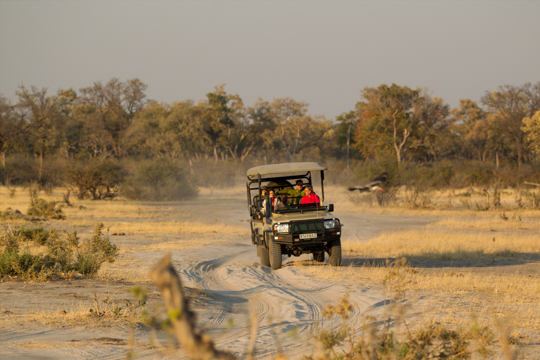 Seven and a half hours at about 10km/h enabled us to appreciate the lions, the many elephants and plenty more en-route. Ghoha Hills was simply amazing. The staff welcomed us like long lost friends and served us lunch before taking us to settle in our rooms. From there we sought out the hide. We sipped pink gins as the elephants cavorted in front of us. As we enjoyed the activities of the large mammals, a cheeky tree squirrel stole the snacks from under our noses. Dinner was a mouth-watering fillet with a spread of fresh veggies and salad. Lying in bed we were serenaded by the howl of the jackals, laughing hyenas and the incomparable roaring of a pride of lions. 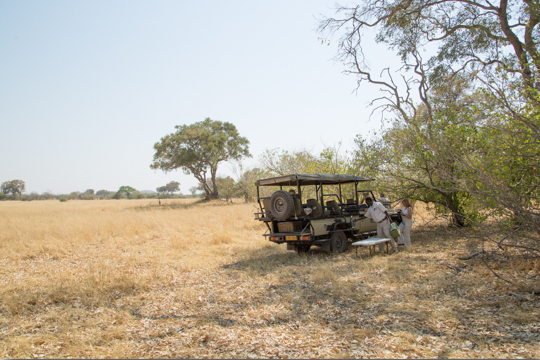 A quick breakfast was followed by a full day safari in our open game drive vehicle through the back roads of the Savuti… Oh, wow! The area around the Dry Savuti Channel teemed with game. 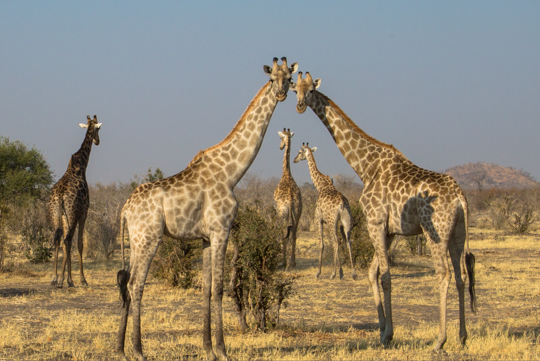 Elephants, lions, lion cubs, buffalo, giraffe and many varieties of antelope and birds elicited gasps of appreciation. We stopped at a waterhole for lunch, enjoying the view of hundreds of elephant drinking and bathing, while the babies chased the warthog. Back at the lodge we again enjoyed Sundowners at the hide, this time with a female lion who had taken up residence... then dinner, where we were joined by our host Abram and Nanette and the evening was spent enjoying fine cuisine and great stories of Africa. Abrams, Nanette and the whole Ghoha Hills team were superbly attentive. It was with reluctance that we were moving along after two rich and relaxing days. 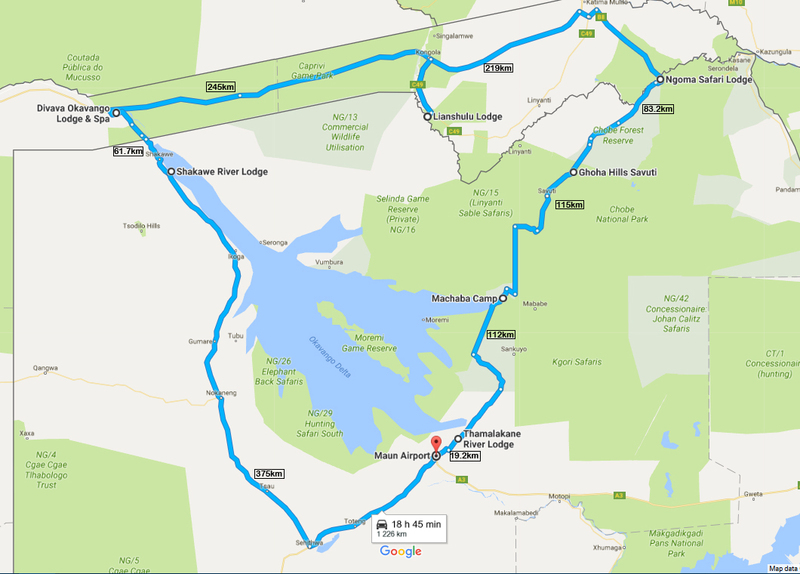 There were still places to visit, remote roads to explore and adventures to experience so we continued north through the Chobe to Ngoma Lodge. The road did not disappoint. It challenged us, both in its conditions and in finding our way around the massive breeding herds of elephants. 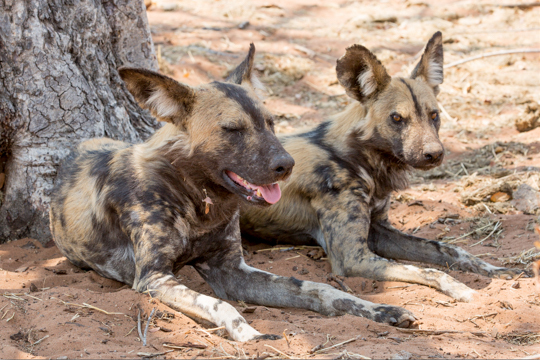 Thanks to Tracks for Africa we were able to find alternate routes most of the time… We got lost once and had to back track and explore a bit, but it turned out well as we happened upon a pack of wild dogs while finding our way. We arrived at Ngoma Lodge in time for a late lunch before hopping on the lodge's bus to Chobe Lodge for a boat cruise on the river surrounded by hippos, crocs, elephants and an array amazing bird life. 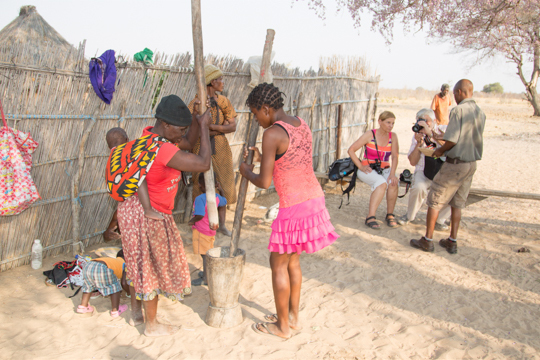 Sadly, we spent just one night at Ngoma as we were off for an early crossing of the border into Namibia. 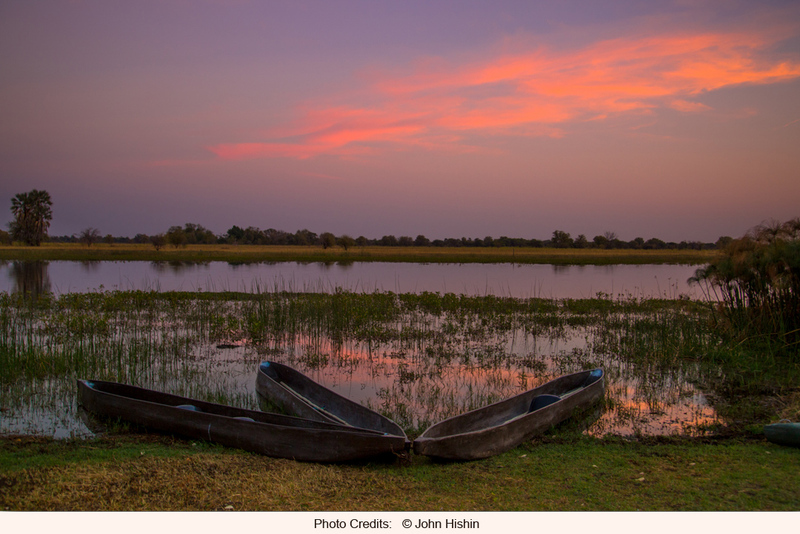 From there to travel the mythic Caprivi Strip. 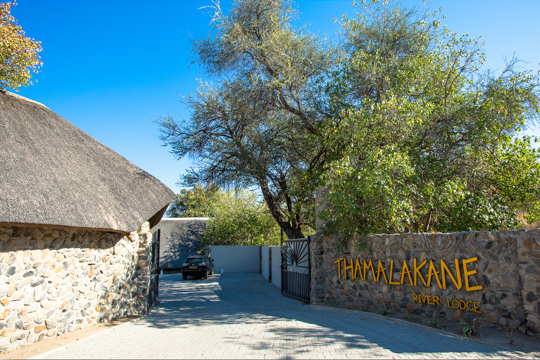 Our first stop was the Lianshulu Lodge in the Madumu Reserve… Sadly the lodge failed dismally. 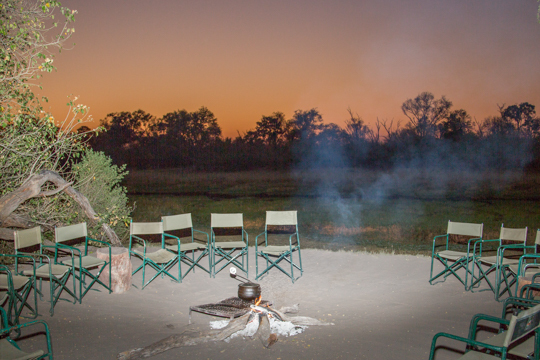 After the splendid service and attention we had received at the lodges in Botswana, it was rather disappointing. 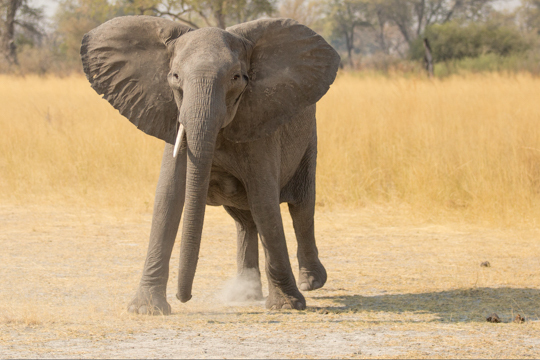 The Reserve was nice and the game viewing good, but the elephants were nervous and somewhat aggressive. The reserve is wild, and allows free camping anywhere you want which is a bonus for those doing camping trips. Dinners here were great though the rest of the meals were average. We were happy to move on after two nights, the first time on the trip, we had felt this way. 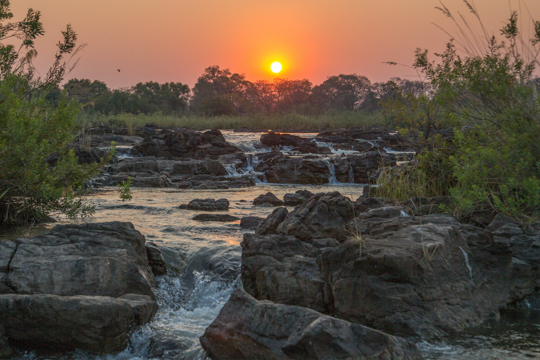 On this day we continued west along the Caprivi, in the direction of our next destination, the Divava Lodge. 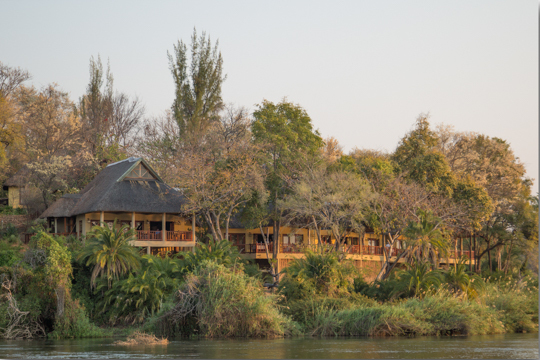 The lodge, built on the bank of the Okavango River as it flows toward Botswana, was spectacular, as was the Okavango swamps. We enjoyed lunch while fish eagles screamed away overhead. After lunch our next adventure started with a visit to a local tribal village. We all felt humbled by the welcome these people gave us… from the women pounding grain, which they prepared and shared with us, to the local blacksmith who demonstrated how his furnace heats scrap metal to make farming implements and the villagers who put on a terrific dance display for us. 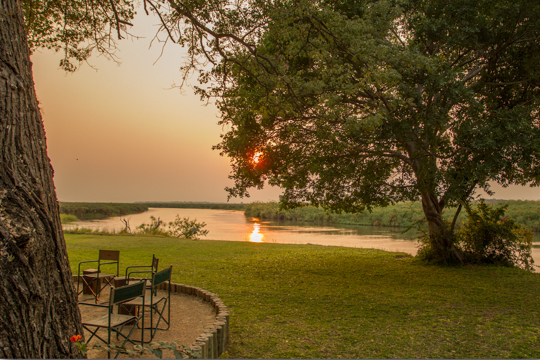 Dinner on the deck was sublime, with the distant rumble of the Popa Falls in the background, the sporadic grunts of hippos close by and the red wine topping it off perfectly. Feeling mellowed by the stunning scenery around the lodge, we opted for a lazy morning and took a boat cruise in the afternoon. 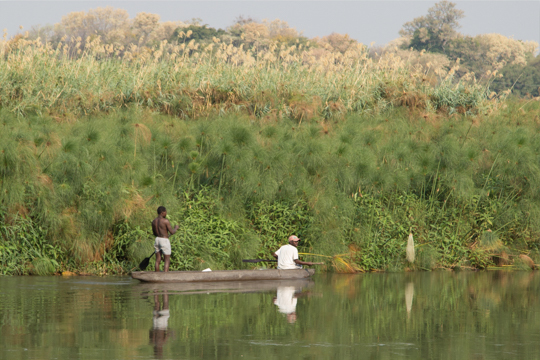 The vessel had us drifting through pods of hippo, getting really close to a croc and watching a myriad of birds. 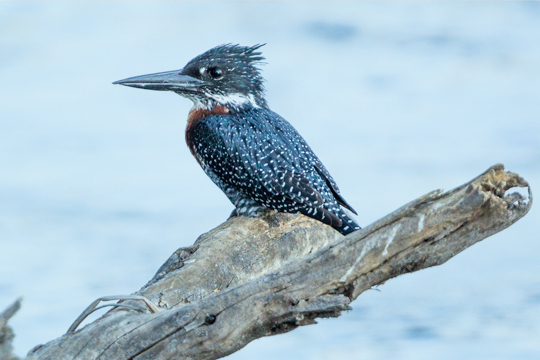 The flocks of young pied kingfishers trying their luck at diving for fish were a glorious sight. Locals fishing from their makoros greeted us in passing and the lovely trip ended with sundowners beached right below the Popa Falls. Drifting down stream, after sundowners, we approached the lodge as the sky darkened to see candles and hurricane lamps lighting the dining area… so we dropped our stuff and headed straight for the deck, where we quenched our thirst on cold beers before enjoying the offerings of the night of freshly caught Okavango Bream and a Medley of vegetables suitably accompanied by a crisp Cape Chardonnay. 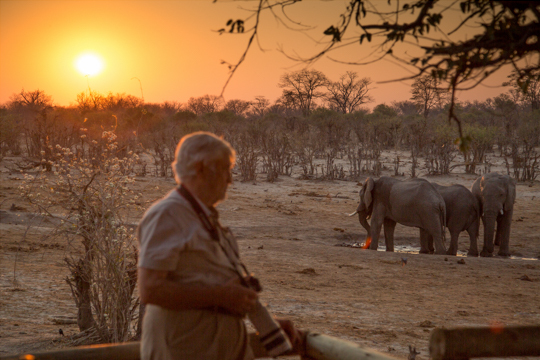 We opted for a slow start as we returned to Botswana, entering at the Mohembo border post and travelling towards the Shakawe Lodge on the Okavango River. After a light lunch we settled into the rooms that would be ours for the next two nights. 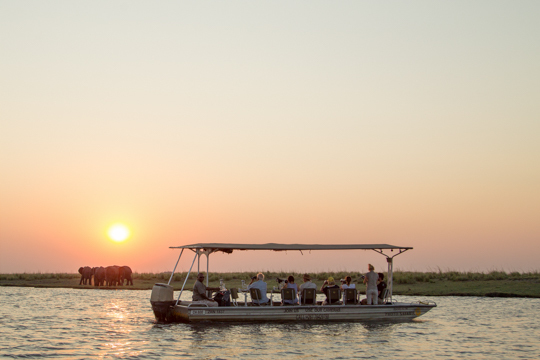 We set off to the Jetty for a three-hour boat cruise along the river, where we were treated to elephants feeding on the islands and hippos splashing as we passed. 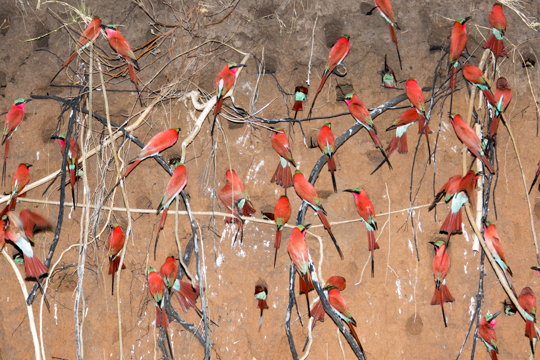 The highlight of the day was a breeding colony of carmine bee-eaters nesting in the bank of the river. Back at the lodge we enjoyed a candlelit dinner with some fine red wine before retiring for the night. 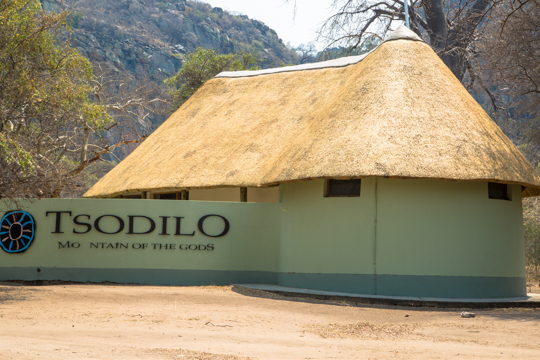 After an early breakfast we were on the road to Tsodilo Hills, the proclaimed World Heritage Site of San rock paintings in the Mountains of the Gods. The stark beauty of this area is indescribable. 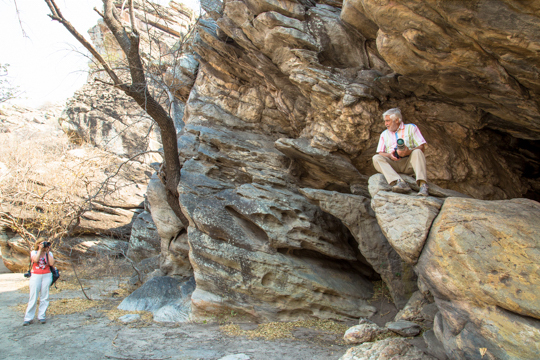 We were enchanted by the stories we heard, told by the passionate local San guide who took us along the paths below some of the 4500 rock paintings. He went out of his way to show us how special this sacred place is. As the temperature rose fast into the 40’s we were happy to get back in the car and to head back to the lodge for a relaxing afternoon at the pool. Dinner was again set with view of the river flowing past lit by a nearly full moon. It was a nostalgic evening as this would be our last dinner together. The following day I was due to drop Wolfgang and Monika off at the Ncamasere air strip. 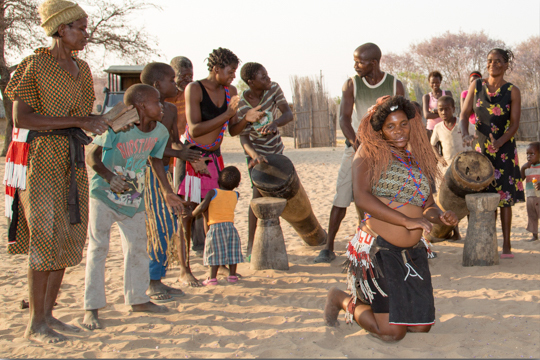 They flew to Camp Okavango, while I continued the road trip alone, with the excess luggage, back to Maun. 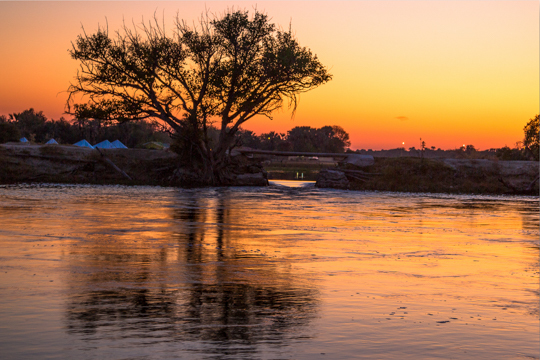 Arriving back in Maun ended the road trip where it had started, with another two nights at Old Bridge Backpackers. 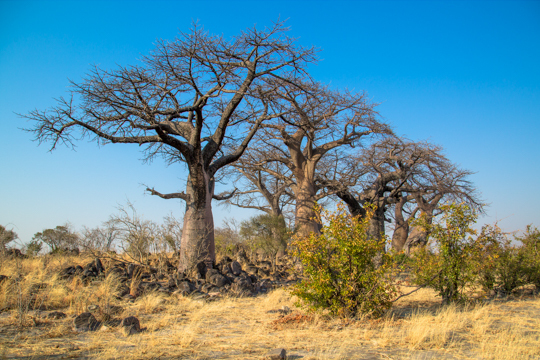 I watched the exciting buzz of Safari operators and tourists coming and going, sharing tips and information, regaling wide-eyed newcomers, who were about to head into the wilderness for the first time, with their experiences and adventures. Let it be said that "safari stories" are much like “fishing stories". With each pint of beer and glass of wine, the animals get bigger and closer as the night flows along. 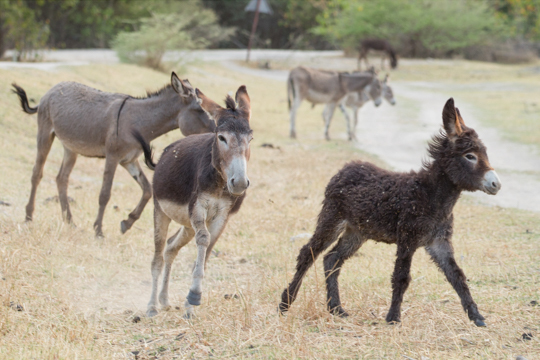 I spent my last full day in Botswana relaxing... watching donkey’s cavort along the shore line. Go siame (Everything is Fine) … Sala sentle! (Goodbye/Stay Well) Botswana!